Interest in the fifth bi-annual international strategic conference on Mozambique Mining, Oil & Gas, and Energy sector (MMEC) is growing at a rapid rate. Established as the leading strategic conference on Mozambique’s extractive industry since 2008, the event will once again allow access to unrivalled selection of interrelated topics under one roof, the event will feature the long established MMEC expo which will provide a platform for companies & organisations to market their goods & services in Mozambique. The event which in the previous edition attracted 60 exhibitors and 600 participants from 32 countries, is scheduled to take place in Maputo on the 27th-28th April, Republic of Mozambique at the Joaquim Chissano conference centre and has attracted sponsorship from Anadarko, Sasol, ExxonMobil, GE Oil & Gas, Matola Gas Company, Shell, Servitrade, Standard Bank, Siemens, Statoil, KPMG and Oracle. Organized under the theme of “Connecting investors, policy makers and industry leaders to drive economic & social development in Mozambique”, the conference will feature over 40 presentations covering Mining, Oil & Gas, and Power sectors as well as panel discussions addressing skills development, regulatory developments, anticipated local content policies and other related issues. 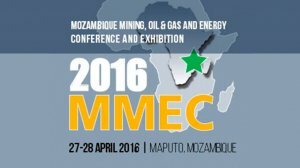 MMEC is a unique platform designed for networking with policy makers, investors, and experts in Mozambique’s Mining, Oil & Gas and Power Generation sectors. MMEC 2016 is organised by AME trade ltd in association with ENH, and AGMM.